So you want to use a buck apron? What is a buck apron? A buck apron looks a lot like a human apron that is tied around a buck’s waist. It creates a barrier, which theoretically makes it impossible for him to breed does. In some designs, there is a weight at the bottom of the apron that keeps it hanging straight down under the middle of the buck’s body. Why use a buck apron? Historically, they’ve been used because people didn’t keep their bucks and does separated. In some parts of the world, they don’t fence their livestock, so bucks and does are together all the time. Karen Stark of OOH RAH Dairy Goats in Rockwood, TN, uses buck aprons for bucklings that she does not want to wean yet. Because some bucklings can breed earlier than others (and you don’t know which ones can do it until it’s too late) most people separate them from their mothers around 2 to 3 months of age. But by using buck aprons, Karen has been able to leave them together longer. How do you use a buck apron? That depends on who you ask. Karen has had great luck with House of Bacchus buck aprons. She’s used them on Nigerian dwarf, Oberhasli, LaMancha, and Nubian bucklings. 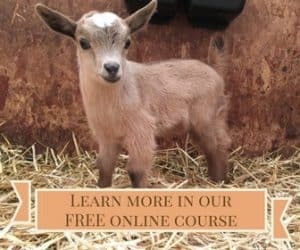 Deb Flint of Dancingdragon Goat Farm in Columbia, KY, made a few different ones for her Nigerian dwarf bucks from plans she found online, and none of them worked. She found them unhooked, untied, or moved to the side, and she wound up with kids from some of the does that were pastured with the bucks wearing aprons. Why NOT use a buck apron? Obviously, the aprons don’t work 100 percent of the time. So, it’s probably not a great strategy to use that as your only means of birth control in your herd. I would definitely not assume that I could let all the bucks and does run together, if the bucks are wearing aprons. DNA testing all of your kids five months later could get expensive. Second, this is not a great option for dairy goats, if you’re talking about a mature buck. Even without the risk of pregnancy, those with dairy goats keep the bucks separate because if a buck is with does, he’ll be rubbing on them, and you will have stinky milk. Who wants milk that tastes like you just licked a buck? 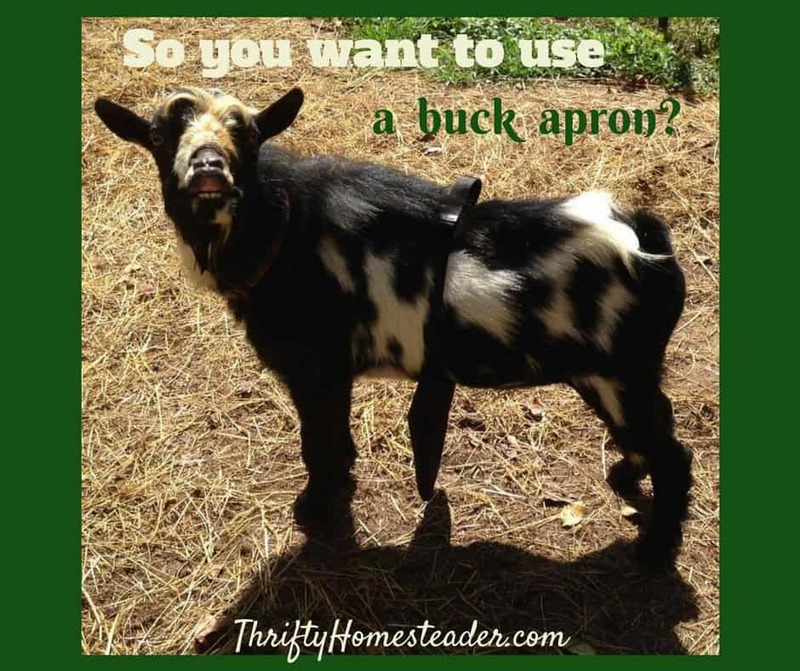 Have you used a buck apron? Since I’m not keeping any bucklings this year, and I am not going to put mature bucks in with my milkers, I’m not able to test out a buck apron with my goats. Have any of you used a buck apron? What kind? How did it work for you? Do you have any tips that could help others? Share in the comment section below. I have the Bacchus Johnson aprons and used them last year on my bucks and only separated when a doe was in heat. Kept them all together till a month before kidding or if the boys were to bucky with pregnant does. The shields are now on the young bucklings starting around 2 months old still with moms and all the other does and kids. Works great!!!!! Highly recommend them. I had one made 4 years ago for my young buck. It worked fine. I didn’t know there was actually something out there that I thought about. I could have a larger one made for him now but I won’t. He doesn’t mind being on the other side of the fence of the does. He’s happier if I have horses out there with him. Running dairy bucks with the milking does will NOT make the milk stink. 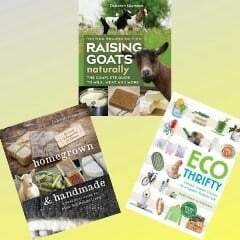 Milk stinks because of poor sanitation, or because the girls got hold of some garlic mustard or similar weed. When a doe is in heat, and the doe is being bred, the doe and her milk will be really gross. Some bucks will rub their head on the doe’s udder, so even your hands will stink when you milk her. So the problem with letting your buck stay with does all the time is that you don’t always know when she’s going to come in heat, and you could get a nasty surprise in the milking parlor. Since we keep our does separate, we know when they’ve been with a buck, and we milk them last. If we smell buck when we’re milking them, we just give the milk to the pigs or chickens. Usually one day is enough, but sometimes it takes two days for the stink to die down. Not true at all. The reason your milk srinks is because u did not put it in ice right away.. The faster it cools the less it stinks.. I have 15 goats and 2 smelly bucks with them and the milk does not stink and neither do the udders. If a buck is rubbing on a doe’s udder, the milk stinks from the moment it comes out of the udder. Cooling it does nothing to get rid of that stink. In fact, no one has figured out a way to eliminate the stink from milk once it’s there. Rapid cooling is important to slow the growth of normal skin bacteria that will cause milk to have an off-taste after a couple of days. Not all bucks rub on the udders, and those that do usually only do it when a doe is in heat. So, if you have not experienced this, it is simply because your bucks are not rubbing on the udders. It is not the cooling of the milk or the buck. It’s the minerals. But I know that even saying that some will agree, but others will think our smeller or taster is off. That may be sometimes, but not always. I used to make raw natural yogurt. I strained the milk, sat it on the counter until it got thick, it was not cooled first. It never tasted off or Bucky/goaty. It was sweet and creamy, it took awhile to develop a yogurty twang, but never goaty. I did run my buck with the goats… he was stinky too! We all believe what we want. I just bought the baccuhas goat apron. After reading your post, I think I may have it too tight… thanks for that bit of information! It is true that some mineral deficiencies can cause off-flavored milk, but there is nothing that will get rid of buck stink. If there was a mineral that would get rid of buck stink, we would all be using it. Have you ever tried washing the udder? I wash very doe’s udder before milking and have never had stinky or off tasting milk – even after i know they are in heat and i had them bred to my buck. I agree any ‘bucky’ milk comes from lack of sanitation and 100% any off tasting milk i ever had was from mine getting into a Cedar patch or them having low minerals. Again, if your buck isn’t rubbing on the doe’s udder, you might not have a problem. We do wash udders before milking, but as I already mentioned, it is impossible to get the buck stink off of it. It’s even challenging to get buck stink off your hands after handling bucks, and we’re washing our hands with soap under running water — usually lathering up repeatedly. I found that if the buck was too skinny it came off. They need a big enough barrel. I agree running the bucks with the does taints the milk regardless of how sanitary the operation is. The problem is due to a phenomenon called sensory adaptation, when we are around the bucks regularly ourselves we develop a tolerance to their smell and no longer notice it in the milk. I assure you the herdshare members can tell if the buck has been near the does even though they never see it. They will ask why the flavor was stronger. Also adult bucks (4 years old or older) have a stronger smell so those using young bucks will likely not notice his smell. I’m a size 32 waist. What size apron would work best for me? Should I add shoulder straps to help keep it in place? On my first year experience with using a buck apron: I looked at the House of Bacchus apron syles last winter, and I noticed I had yards of vinyl I’d purchased years ago, so I purchased some dollar store adjustable collars (Large) and made some curved vinyl pockets in 4 sizes for my buck kids & juniors. the pockets were sewn like pillows, with an opening at top for the collar to slip through, and I put a limestone rock in eachone (from our driveway gravel) to weight it down. We had 7 buck kids this year in mixed gender, dam-raised litters. the buck kids all got aprons by 6 weeks, and some of the little guys kept them on unti about 20 weeks when I finally put them in with the big bucks part time. They were able to nurse until 16 weeks, which has promoted good bone growth & digestive health. The only thing I found concerning with the little bucks and their sisters was that, at nap time, they flop in a pile. When lying down, the buck’s procreative tool can and did snake out past the apron unimpeded, and a sister might be (was) flopped down with in front. I removed the buck kids from the mixed kid group at 12 some weeks after I noticed this and brought them back for periods to play and nurse. I wouldn’t recommended aprons in a situation where the doe absolutely shouldn’t get bred, but I think during the natural nursing cycle, they’re great. On aprons for adult bucks, I might use them short term for situations like show transport (out of rut of course) , when stress makes the animals less likely to breed anyway, but I’d be caustious of the same situation I saw in the kids happening at naptime. The little bucks who grew up in aprons seemed to like wearing them.